downloaded into a robot head? Idea, ideas, ideas. Throwing stock characters into particular situations. Has made a rather specific effort to use female protagonists, without necessarily making a big show of this. Plots with lots of threads. And, of course, his fair share of one-liners. When tackling vampires, it's important not to be cheeky. A mainstay in the Prog in recent years, Kek-W begun as something of a perennial nearly man. A Future Shock / Vector 13 / Pulp Sci-Fi here and there, a crack at a short series or two, often threatening to be the next John Smith but never quite climbing to the top of the thrill-power pole. Delightfully enough, he got there in the end, giving hope to wannabe script droids up and down the land that if you keep plugging away, greatness will come. 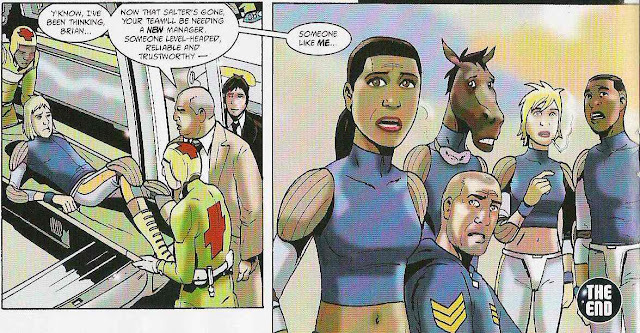 Bizarrely, Kek-W’s actual first published work was as a Mark Millar replacement, of all things. (Although he may have written some of his Future Shocks first, I shouldn’t wonder). He took over on second series of The Grudge Father (actually artist Jim McCarthy’s baby, rather than Mark Millar’s), and then on a second series of Canon Fodder (which Millar was apparently less happy about). Just for fun, it’s worth comparing and contrasting two very different writers. Millar’s work is loud, attention-gettingly over the top, straightforward, violent, features one-note characters, and has plots that are often, for want of a better word, stupid. The man is also incredibly self-promoting, and, ultimately, one of the world’s most successful ever comics scribes. Kek-W’s work is weird, veers to the side of being straightforward, violent, over the top, features two-note characters, and has dense plots that can be hard to follow but always end up being coherent. The man hides behind a pseudonym, and is, one imagines, not widely thought of as a comics superstar. If there’s a message here, it’s that age-old one – no-one ever lost money underestimating their audience. Do note that there are, pointedly, two similarities marked above: violence, and going over the top. 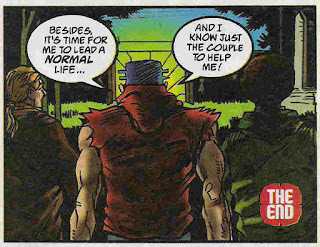 Combining the two is, of course, part of the essence of 2000AD, and a guaranteed way to get some humour into your strip. Now, I don’t want to make the simple case that Kek-W is a far superior writer to Mark Millar. I do think he’s a much better 2000AD writer, based mostly on the strength of his ideas. Early Kek-W definitely lacked a certain discipline that could make his word hard to follow, or, rather, it’s that while the ideas were generally pretty smart, some of the storytelling around it needed more room to breathe to match up. It’s telling that the success he’s had lately with Angel Zero (well, I liked it a lot) and especially The Order were both much longer serials that he’d had before. Let’s get back to specifics. Grudge Father, as an excuse for extreme gore with a bit of noodling around with the concept of cloning, made more actual sense in Book II than it did in Book I. But really it’s the art that’s to be celebrated, for me. Canon Fodder II doubles down on this. What’s notable, though, is that while CFII: Dark Matter has a complex plot that does actually add up across the whole, it did lack a little of the balls-out crowd pleasing of Book I. Sure, Millar’s original set-up made no sense, but you really wanted to follow Holmes and Moriarty into the rabbit hole of finding God. It's all non-science, of course, but at least he puts the effort into explaining it. Kek-W’s first proper creation was Kid Cyborg, centred around a winning protagonist and his journalist buddy. The pair end up on the run from the US military-industrial complex, and it’s all very 1990s conspiracy-theory / media studies stuff. Honestly, if it’d been maybe twice as long, it could have been a lot better. Too many characters, emotions and ideas and not enough space for anything beyond a bit of a chase and some funny lines. Kid Cyborg's rise to the White House was all too rapid. Also, more one-liners. Much later, Angel Zero explored some similar themes (minus the media angle), and for whatever reason that one really worked. I think it might have been simply that we had a couple of early episodes to get to know our hero before she’s then catapulted into a chase / fight / flashback rush. Certainly that strip was high on the emotional impact of having your life turned upside down, and leaving loved ones behind. ...before a mad idea storm. Long before then, of course, Kek-W had a stab at two classic 2000AD genres. 1) Unbeatable scheming bounty-hunter woman in space, in the form of Rose O’Rion. Picking up from a Pulp Sci-Fi introduction, her two outings were fun but unremarkable. To some extent it serves as a warning to the fact that just having a woman as your hero isn’t quite enough. I blame Tharg for that one, more than Kek-W himself. O'Rion alwyays has an ace up her sleeve. Defusing the tension with a little joke there. More cocky antics from O'Rion. 2) Sci-Fi sports romp, in the form of Second City Blues. I’ve a lot more time for this effort. Given the restrictions of the genre, Kek-W does a truly admirable job to try to bring something fresh to the tale. He was even given room to let it work, but in all honesty I think it needed even more room if it was really going to become a recurring feature. There's an awful lot going on in this set of panels to set up character interactions. Think about how much is going on: pointedly using future Birmingham as a setting. Six different protagonists, each with a proper personality and backstory to explore. An actual sport to play, with obligatory training sequences as well as matches. Having to set up vaguely how the sport works. Having to demonstrate why this particular team is good at the sport. And, of course, an evil owner with his own mysterious agenda. 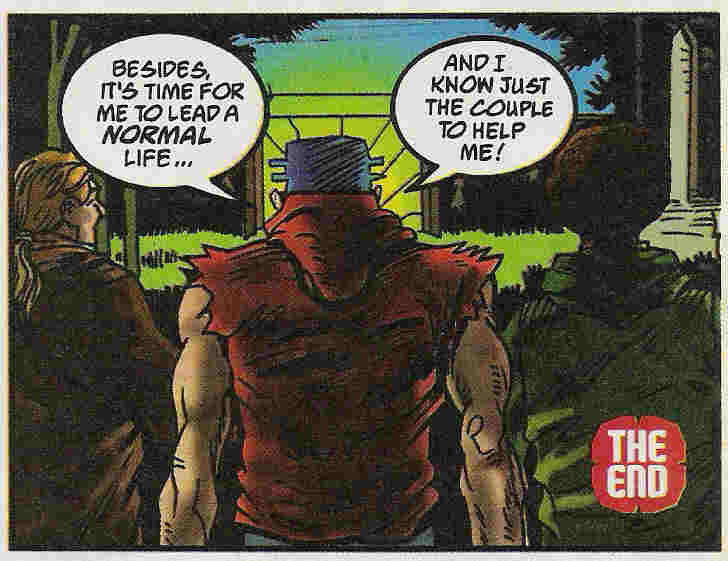 It’s this last part which ended up being both the most interesting and most derailing thing about the strip overall. Bloody alien tossers indeed! A delightfully 2000ADish villain lurking behinis the scenes of the strip. As with all future sports stories, the game itself - slamboarding - is pretty important. 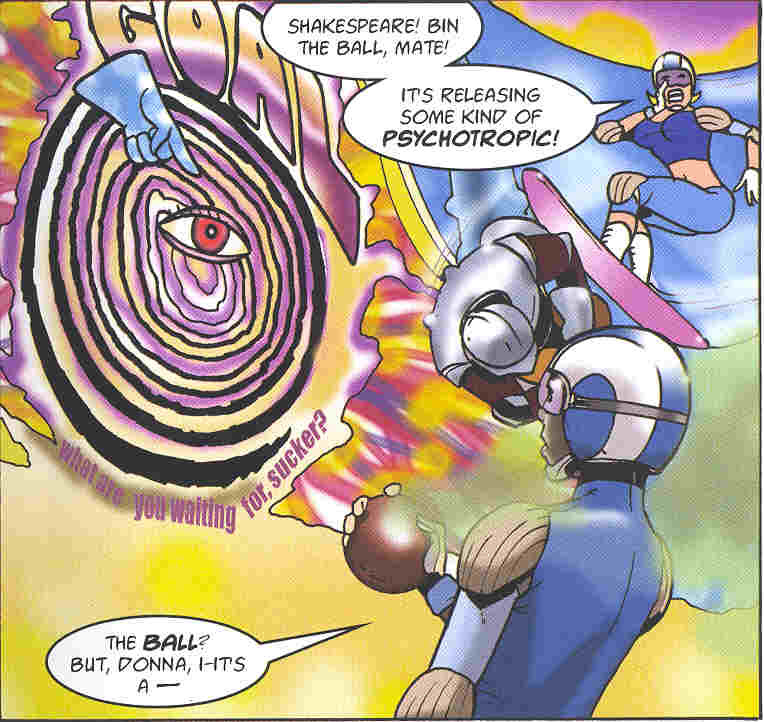 I’d say its more coherent than Street Football and Inferno, not quite as persuasive as Aeroball (clearly the main inspiration). Rogue death ball in play! If the game doesn't turn bloody, it's barely worth reading about, eh? I could say a lot more about the cast of heroes, too. At the time it all came across a bit clichéd, but the recent Meg reprint has revealed it to be stronger than that – you get the impression that with a second series, each character would have really come into their own, after getting past ‘first episode of a sitcom-itis’ that plagues all intros. Which leads us to the man’s two greatest successes so far, The Order and Deadworld. 2000AD had a serious gap in the market for using knights in armour, which The Order fills neatly across two different time periods and three locations so far. There are women at the heart of it all, once again, but this time surrounded by older man. Best of all, the readers were thrown so utterly into the deep end that we’re learning what’s going on at the same time as the characters. Less time for clichés, more time for mad mental craziness with wurms and robot heads and Teutonic legends and, of course, ultra-lush John Burns scnerey and period costumes. Series two was even more mad, starting with conquistadors in Columbia (or whatever it was called in those days), before launching into Tudor London, and yet somehow harking back to the Medieval shenanigans of series one. Who knows where series two will take us? I for one can’t wait to find out. Deadworld, too, comes unburdened by backstory. Partly because we already know the story, following as it does years of Judge Death mythology. But mostly because the whole thing was literally inspired by a dream. Much like the Grudgefather, Dreams of Deadworld came from an artist first, with Kek-W called in to try to put some sort of narrative structure to it. Also much like Grudgefather, that source dream, belonging to Dave Kendall, must have been seriously dark and frightful. Ultra-fascist police state oppresses people. Groups of rebels are hoping to fight back. Meanwhile, within the ruling police force, a new group (lead by Sidney De’ath) is taking control, with the aim of literally killing EVERYONE, partly by means of truning the very climate of the world into some sort of festering pit of decay. So some of the (basically evil) cops find themselves fighting against other cops, and may or may not wish to ally themselves with the rebels. Who are not exactly nice either. And EVERYONE IS DOOMED TO DIE. Let’s just hope it’s not all a prescient metaphor for the real world (as science fiction often is…)! Plus, of course, the whole thing is laced with laughs. Somehow, Kendall and Kek-W keep it readable, even emotionally accessible. And it’s a great set-up to allow for some purple prose to paint a picture of permanent putrefaction. (without having to resort to cheap alliteration to score points). It’s almost irrelevant what’s actually going on from episode to episode. Kek-W, a droid ever on the rise – we salute you! *Giving credit for a character who is little more than a rock/pop pun is perhaps too much, but it delighted me then and delights me still. **His real name is no secret, it’s Nigel Long, but since he’s only ever been published in 2000AD under his more fun pseudonym, I’m sticking with that. ***Let’s be honest, I’ve no idea where he got the ‘living ball’ idea from; I doubt it’s original to either JK Rowling or Don Coscarelli anyway. 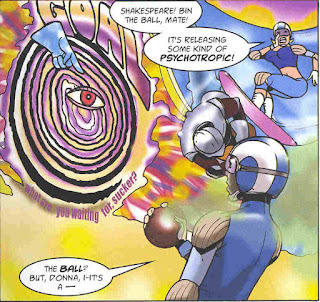 According to Chris Weston, Nigel Long's absence from comics was due to "a severe illness" (quoted in Thrillpower Overload, page 185). I'm sure the changes of publisher and editorial staff didn't help when he eventually tried to get back into 2000ad. Real life and facts - getting in the way of idle speculation since they switched the internet on! But seriously, it's excellent that he recovered, and that his illness didn't dent his ability to write cracking stories.